Bruce Bohannon, the pilot of the Exxon Flyin' Tiger, attended the 6th Annual Virginia State EAA Fly-in, September 7-8, 2002 at the Dinwiddie County Airport. His homebuilt plane has set many world class records, most recently the World Record for Absolute Altitude in Class C-1.b of 37,536 feet (pending certification by NAA and FAI ) and the World Record Altitude in Horizontal Flight in Class C-1.b of 35,497 feet, both at the Sun 'n Fun fly-in in April, 2002. Known in aviation circles worldwide as "Mr. Time to Climb", Bohannon's name now goes into the "World & United States Aviation & Space Records" book a seventh time. Three of those records were set in his world famous Formula One racer "Pushy Galore", now on display in the Experimental Aircraft Association Museum in Oshkosh, Wisconsin. 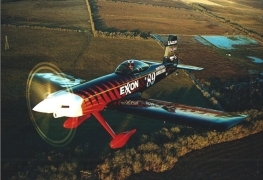 The Exxon Flyin' Tiger is a single engine, single seat Experimental aircraft designed and built by Bruce Bohannon to climb faster and higher than any other piston engine airplane. Since its introduction in 1999, The Tiger has set four World Records for climb and altitude, "And we haven't even scratched the surface of what this airplane can do", says Bruce. While sponsored by big names like Exxon Elite Aviation Oil, engine overhaulers Teledyne Mattituck Aviation and ignition manufacturer Unison Industries, "Team Tiger" is strictly a homegrown operation. Some members of Bruce's all-volunteer crew have been with him for over 10 years . Quietly continuing research and development at his private airstrip, Bruce Bohannon promises even more incredible feats from his homebuilt dragster, The Exxon Flyin' Tiger. Edmund G. - Fast Eddie - Leuter, The Voice of Fun, was the announcer throughout the fly-in. Eddie has been announcing radio control model airplane shows since 1985 and full size airshows since 1994. Some of the shows Eddie has emceed over the years incluyde Matt Chapman Air Shows, Santa Fe Air Show, the EAA East Coast Fly-In, and the Great Casey Jones Balloon Classic and Air Show. Eddie brings with him a love of aviation, a great sense of humor, and an excellent knowledge of airplanes. Roger Lehnert is one of the East Coast's most entertaining and unique airshow performers. Roger's first plane was a 1930's vintage Taylor J-2 Cub that he found in the back of a barn. Since then, Roger has been involved in several airplanes, including the building of a Pitts Special aerobatic biplane, which he flies in International Aerobatic Club competitions. Roger also restored a pair of Piper J-3 Cubs, one of which he uses in his thrilling airshow routine. The Cub's dependability and flyability, especially at slow speeds, makes the J-3 a natural for the climax of Roger's show. 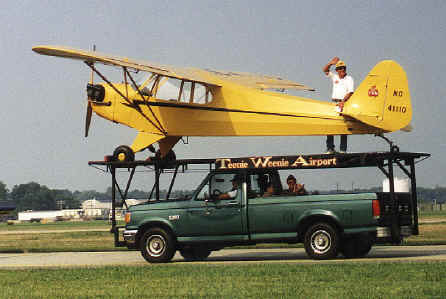 He takes off, and lands the plane, atop the "Teeny Weeny Airport," a Ford pickup modified with a heavy-duty suspension and a steel platform above the roof. Skip Stewart flew a routine with mind-blowing gyroscopic tumbles, and precise, hard edged maneuvers taken from modern aerobatic competition, in his Pitts Special S-2S. 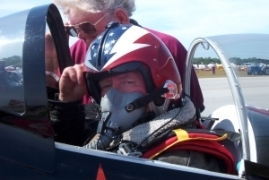 Skip has been flying aerobatics for over fourteen years and competition aerobatics for over three years. 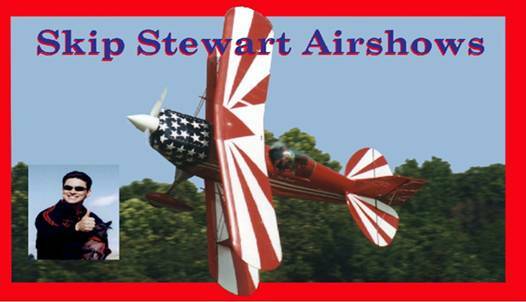 He has won several competition flights and has been awarded the coveted Pitts Trophy.